Jake Dennis scored a sixth place finish in the Blancpain GT Series Endurance Cup six-hour, 1000 Kilometres of Paul Ricard in a race of attrition as leading cars fell away in the final hour. The night race, run in preparation for the series’ next round, the 24 Hours of Spa, was settled in the final hour as the #17 Team WRT Audi R8 LMS of Dennis and team-mates Stuart Leonard and Robin Frijns filed up the order thanks to a storming final stint from Dutchman Frijns. 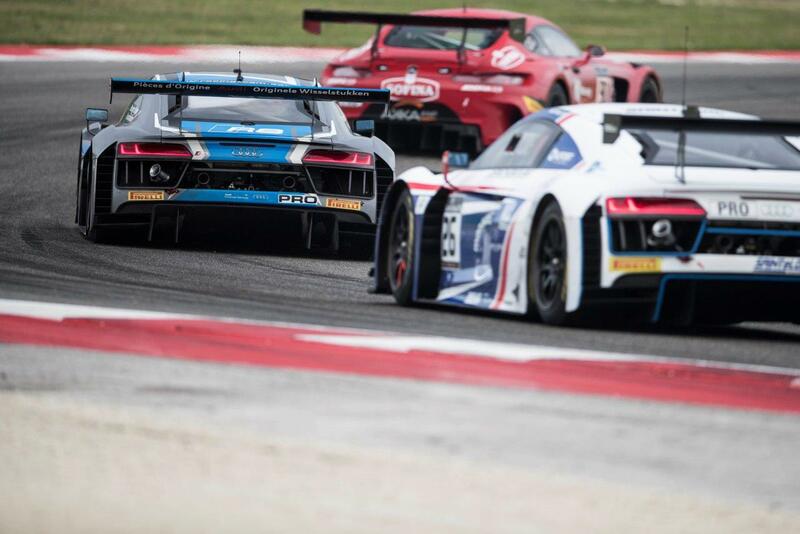 Dennis began the race in the #17 Audi R8 LMS and was soon in the middle of the action, attempting to move up the inside of the #50 AF Corse Ferrari 488 GT3 of Pasin Lathouras at the end of the long straight, Turn 10 on lap six. With another Ferrari looking to also overtake on the outside, Dennis and Lathouras made contact with the Ferrari spinning off the track and Dennis moving up to 14th position. Following a stewards’ investigation into the incident, no further action was deemed necessary. On lap 15, a Full Course Yellow and safety car prompted some cars include Dennis to pit and switch for team-mate Stuart Leonard to take the wheel. On the restart, with cars ahead finally making their first pit stop under green flag conditions, Leonard moved up to 14th position before the #7 Bentley Continental GT3 hit trouble, promoting Leonard with under 90 minutes complete. Leonard made his way up to 10th before pitting for Dennis to return to the car with an hour and 40 minutes complete, returning to the track in 15th position and climbed to 13th as cars ahead sustained damage. With the leading cars making their pit stops past the two-hour mark, Dennis was promoted back up to 10th position, battling throughout his second stint to bring the car back into the pits with two hours and 15 minutes complete, in ninth spot. Leonard took to the wheel once again, returning to the track in 13th position. Following contact, he struggled throughout the remainder of the stint, dropping to 17th position and being caught by the fellow Team WRT #6 car of Nathanael Berthon. With just over two hours remaining, Robin Frijns replaced Leonard for his first and only stint in the car, returning in 12th position by 39 seconds behind the fellow Team WRT #2 Audi R8 LMS of Pieter Schothorst. Frijns was on a mission to scythe into Schothorst’s advantage, and with 90 minutes remaining, had reduced the gap to just 13 seconds when both he and Schothorst pitted on the same lap having moved up to 11th position following the #84 Team HTP Mercedes-AMG GT3 of Franck Perera stopped on track with mechanical woes. With the #50 AF Corse Ferrari 488 hitting trouble and limping back into the pits with exactly an hour remaining, Frijns had worked his way into 10th position, only four seconds behind Schothorst’s team-mate Christopher Mies who replaced the Dutchman in the #2 Audi. With less than 40 minutes remaining, Mies’ margin had been slashed to just 0.3 seconds and Frijns swiftly made his way past the fellow Audi into eighth position. With the once-leading #4 Team Black Falcon Mercedes-AMG GT3 machine of Luca Stolz crawling back into the pit lane with 30 minutes remaining, Frijns made up a further spot into seventh and was swiftly hunting down the ISR-run Audi R8 LMS of Filip Salaquarda which held an eight-second advantage. With less than five minutes remaining, Salaquarda heeded to Frijns’ pressure to relinquish sixth place, but with the RJN Nissan of Alex Buncombe a further 22 seconds up the road, Frijns ran out of time to further threaten the top order but came home in an excellent sixth position. The #8 M-Sport Bentley Continental of Andy Soucek/Maxime Soulet and Vincent Abril scored outright victory almost 30 seconds ahead of the #72 SMP Racing Ferrari 488 GT3 machine of Victor Shaytar/Miguel Molina/Davide Rigon. The Team WRT squad was represented on the podium with the #1 Audi R8 LMS shared by Antonio Garcia/Nico Müller/Rene Rast claiming third position.